Part of me says this is probably gorgeous and that the scan in no way does it justice. But the other part of me says that this looks like a new version of Lord of the Rings. Ugh. 1. We probably need fewer translations of Inferno and more of Purgatorio. 2. 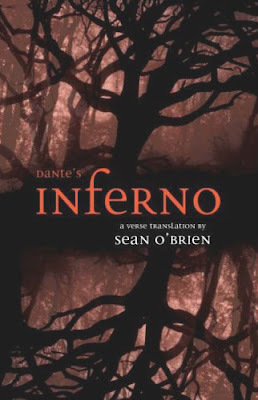 All of the covers for editions of Inferno follow the same formula: scary, atmospheric picture that inevitably fails to allude to how packed Dante's Hell really is. Perhaps Bosch for a change. I found myself within a forest dark . . .
Not really an image of hell itself, but a bit more subtle. Not really sure about this cover. It's not bad, just not brilliant either (in my opinion). Either way, all three volumes are well worth a read.